I received the following letter, written by Bishop Edward Slattery for the priests of the Catholic Diocese of Tulsa, Okla., from a priest-exorcist in said diocese. As you have read in the newspapers and seen reported on the nightly news, a group called the Dakhma of Angra Mainyu is planning a Black Mass in Oklahoma City on Sunday, September 21. As a part of Satanic worship, a Black Mass attempts to invert the action and meaning of the Mass in order to mock Christ's sacrifice and worship Satan through an orgiastic ritual of pain and perversion. It blasphemes everything which we hold as sacred and redemptive; and as the Mass is efficacious because it offers true worship to the Father through the Son and by the Spirit, so we fear that a Black Mass would be effective in a negative sense by offering worship to Satan, the prince of this world. There seems to be little response from Oklahoma City's Civic Center to the pleas of Archbishop Coakley that a tax-payer supported public venue not promote as entertainment nor expect to make a profit from outraging the religious beliefs of more than 200,000 Oklahoman Catholics. Since this is the case, I want to do what we can together to meet the dangerous challenge of Satanic worship through prayer and adoration. Prayer is our only weapon. Please pray with me; the matter at hand is serious! First, we should ask God, through the intercession of Our Lady, to avert this evil. For this end, I will ask that the nine days prior to the Feast of Our Lady's Assumption (August 6 through August 14) be kept throughout the diocese as a period of prayer and penance. I hope, Father, that by your words and example you will encourage the faithful of your parish to abstain from meat in this period and, wherever possible, to fast and abstain as we do on Ash Wednesday and Good Friday. Let these nine days be consecrated as well by special prayers and heartfelt invocations. I am asking that every Catholic make the effort to pray one decade of the rosary and the prayer to Saint Michael the Archangel in order that by Our Lady's intercession, this event might be cancelled. I am attaching to this letter a sample set of prayers. Please duplicate them and make available them – by every means possible. Next, on August 15, I would ask every priest in our diocese to join me in praying the Leonine Exorcism prayer for the safety of the people he serves. This prayer, composed by Pope Leo XIII, is to be found in the Latin 1962 Roman Ritual. I am having a new English translation of this prayer prepared for us and when it is finished, I will send you a copy. This will likely be next week. This minor exorcism is to be prayed privately and without ceremony by the pastor (and associate) standing at the altar, at whatever time may be most convenient that day. Let us ask that God deliver us from this evil and that the event be cancelled! Trusting always in the Providence of God, and invoking the intercession of Mary, whom Scripture promises will crush the head of the serpent, let us be without exception in this effort. May Christ Our Lord deliver us from every evil, and defend us against this present danger. 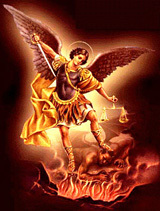 Saint Michael the Archangel, defend us in battle; be our protection against the wickedness and snares of the devil. May God rebuke him, we humbly pray; and do thou, Oh Prince of the heavenly host, by the power of God, thrust into hell Satan and all the evil spirits who prowl about the world seeking the ruin of souls. Amen. Heartbeat International, the world's first and largest network of pregnancy resource centers, announces two million people have reached out to its 24-hour hotline Option Line, designed for those seeking abortion alternatives and pregnancy resources, since its inception in 2003. With more than 100,000 hours of non-stop operation, Option Line utilizes phone, email, text messaging and live chat to help women facing unexpected pregnancies to connect with local, community-based assistance 24 hours a day, seven days a week. Heartbeat has accomplished this goal through more than 2,000 pregnancy help networks connected to Option Line and will continue to assist even more in the days ahead. In a recent post, board member Pia de Solenni noted the irony that while some abortion supporters are targeting pro-life activities by claiming that abortion opponents are waging a 'war on women,' it is, in fact, pro-life initiatives like Option Line that are there to meet the needs of women any time of day or night, helping them to connect with local resources so that they are empowered to make their own choices. 'A woman who is considering abortion is most often crying out in desperation and loneliness. That is why Heartbeat's Option Line was founded, so that every woman could be immediately connected to the life-giving resources in her own community and choose life, not death,' said Heartbeat International President Peggy Hartshorn.